between agents, owners and  actions undertaken by services. represent the shared state between the various players. order (or policy etc.) is called the *enactment* of the purchase order. make legal judgements in a court of law. 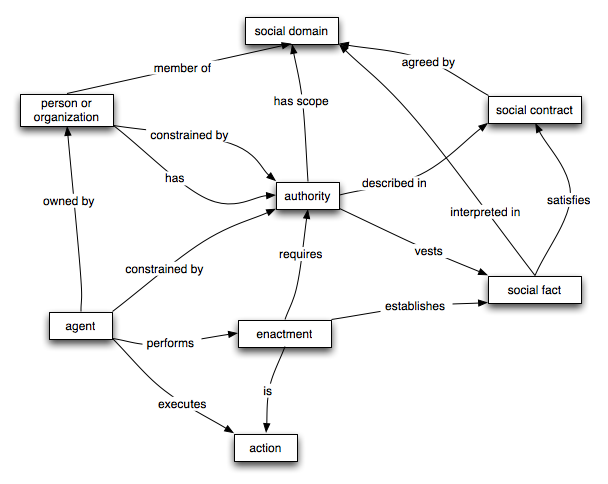 between agents, policies, policy declarations, and valid constraints. Next message: Jeff Lansing: "Re: A social model"
Previous message: Francis McCabe: "proposed reworking of service model"
Next in thread: Jeff Lansing: "Re: A social model"
Reply: Jeff Lansing: "Re: A social model"